Not only was Glenmalure Park seen as the spiritual home of Shamrock Rovers for many it was the spiritual home of Irish football. Situated in Milltown on the southside of Dublin, Glenmalure Park witnessed some of the finest moments in League of Ireland history and when it was sold to property developers in 1987 signalled the terminal decline of professional soccer in Ireland. Since then the League of Ireland has gone through a number of re-inventions and convulsions that has seen total top flight league attendance's fall as low as 10,000 on a match weekend. In the halcyon days of the League 28,000 packed in to Glenmalure to watch Rovers play Waterford less than 20 years before the sale of the Milltown football ground. The relatively recent move into the Tallaght Stadium in 2009 by Shamrock Rovers may signal a phoenix-like rise from the ashes of Glenmalure Park - but only time will tell. Shamrock Rovers has it's origins in Ringsend, Dublin 4 and for some League of Ireland fans the real Dublin derby is between Rovers and Shelbourne which also hails from the Ringsend area. In 1926 Rovers moved to Glenmalure Park in Milltown with the first official match in September. A crowd of 18,000 fans watched Rovers play a friendly against Belfast Celtic and Irish international player Bob Fulham scored the first goal at Glenmalure. Shamrock Rovers took out a long lease from the Jesuit Order who had a presence in Milltown from 1880. In the 1930's the Cunningham family, who ran a chain of betting shops, acquired the football club and gave the ground the name 'Glenmalure Park' after the old family home in Glenmalure in Wicklow. The Cunninghams developed the ground with terraces right around the ground with seating for 1,000. The official capacity of the ground was approximately 20,000 although, as mentioned earlier, this capacity limit was breached on occasions. Shamrock Rovers won most of it's league titles and FAI Cups during the Glenmalure Park era, including four league titles in a row in the 1980's, and six FAI Cups in a row in the 1960's. In 1972 property developers, the Kilcoynes (Louis, Barton & Paddy), bought Shamrock Rovers from the Cunningham family following a failed attempt to buy Drumcondra from the Proles. The Cunninghams had become disillusioned with falling attendances. Louis Kilcoyne described his rationale for buying Rovers thus, "...we took the club over thinking we could awaken a sleeping giant. However, in hindsight, there was a bit of naiveté there." Following a barren period on the pitch Louis Kilcoyne persuaded his brother-in-law, John Giles to move back to Dublin to embark upon the, ultimately doomed, John Giles / Shamrock Rovers project. Hard on the heels of that Kilcoyne hired Jim McLaughlin as manager who promptly delivered three League of Ireland titles in a row in the mid to late 1980's. To the great disappointment of the Kilcoynes it appeared that nothing that they had tried was bringing the fans back through the turnstiles. Because of it's rich history and relevance to League of Ireland Glenmalure was somewhat synonymous with the League - even to non-Rovers supporters. It had been the setting for many thrilling football moments, a place where dreams were realised, and where legends were created. For many football fans the decision to sell Glenmalure was a crushing blow to the League from which it never recovered. "As we grew over four years our crowds diminished ... to 800 - 1,000 ... my brother, Paddy Kilcoyne, who was our financial controller said, 'I'm out of here, I'm not propping this up any more ... we are wasting our money here.' ... It was our company Healy Homes that was propping up Shamrock Rovers for seventeen years ... I argued that we would stay for one more year and would give notice because in PR terms we knew we weren't going to be popular. Then we began to talk to Home Farm, Brendan Menton jnr particularly, about sharing with them at Tolka and he was delighted because we would make a contribution to the upkeep of Tolka basically. When it was established that we could go there the decision was not one year's notice, we'll just get up an do it. We did that with about two or three matches to go. When word got out, by way of the beginnings of the protest, we got 1,200 at our next game whereas before we were getting 300." Suspicions that the Kilcoyne's had planned part ways with Shamrock Rovers from some time back when it emerged that the Kilcoynes had bought Glenmalure Park from the Jesuits "... a few years previously and we bought it on the premise that the rent they were getting from us was a pittance in relative term, whereas if we gave the x thousand pounds to purchase it they were far better off. And they agreed with that. It was good business decision as well, though." This left the way clear for the Kilcoynes to sell Glenmalure Park. The announcement that the Kilcoynes were to sell Shamrock Rovers home ground to property developers was met with howls of derision and physical protests that at times became violent. The severity of the reaction by Rovers fans and other members of the Irish football community seemed to catch the Kilcoynes unawares. The issue spilled off the sports pages and received a lot of coverage in mainstream media. The chairman of KRAM, Liam Christie, described the situation as follows, "They [Kilcoynes] were taken aback when there was such an upheaval against them ... The campaign took over quickly and we were getting money in ... from everybody." KRAM attempted to raise enough money to buy the ground to keep Rovers at their spiritual home. According to Louis Kilcoyne the most that the members of KRAM "... ever had in their bank account was about £30,00, and let's say that Glenmalure was sold for a lot more than £30,000." Kilcoyne never went public on how much the Milltown site went for he did acknowledge that it had sold for a six figure sum. Others speculated that Glenmalure Park was sold for £5 million. 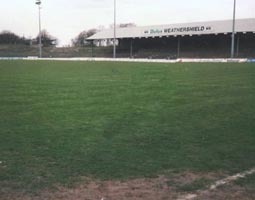 The last Shamrock Rovers match in Glenmalure Park was in the FAI Cup against Sligo Rovers on 12th April 1987. (An interesting bit of symmetry was that the first Shamrock Rovers match in their new permanent home, after 22 nomadic years, was a 2-1 victory over Sligo Rovers). Ironically the attendance at Milltown on that day was 6,000. If Rovers fans had turned up in those numbers for every match it is doubtful if the Kilcoynes would have sold Glenmalure when they did. At half time there was a pitch invasion that also included Sligo Rovers supporters to demonstrate solidarity with there fellow fans. There followed more than two years of action and protest by KRAM but despite the protesting and the fund-raising by KRAM the sale went ahead. In 1990 the bulldozers moved in to demolish the Glenmalure Park terraces that Louis Kilcoyne later described as a "s**t hole" thus consigning Shamrock Rovers to a nomadic existence that lasted almost 22 years. The only evidence that some fantastic and historical Irish football encounters ever took place in Milltown is the Glemalure Memorial Monument.